Book by Oscar Hammerstein II and Joshua Logan, based on Tales of the South Pacific by James Michener. Music by Richard Rodgers. Lyrics by Oscar Hammerstin II. The original Broadway production opened on 7 April 1949 and was directed by Joshua Logan. The production closed on 16 January 1954, running for a total of 1 925 performances. A film version was released in 1958, while a television film was made in 2001. On a South Pacific island during World War II, two little children are playing on the terrace of the home of a rich planter (DITES MOI). The planter, Emile de Becque, has fallen in love with Nellie Forbush, a young Navy Nurse from Little Rock, Arkansas. Nellie, a self-described country hick with an unremittingly sunny outlook (A COCKEYED OPTIMIST) finds herself drawn to this dark and brooding Frenchman (TWIN SOLILOQUIES), whose romantic and passionate emotions win her over (SOME ENCHANTED EVENING). Also stationed on the island are a group of restless sailors, seabees and marines who are obviously bored and sorely in need of female companionship (THERE IS NOTHIN’ LIKE A DAME). Souvenir collecting is about the only active pastime and has developed into a marketing war between Seabee Luther Billis, who has cornered the market in everything from grass skirts to shrunken heads, and BLOODY MARY, the local Tokinese dealer in such trophies. Lt. Joseph Cable, a handsome young Marine, arrives with an assignment to persuade de Becque, who is familiar with the nearby islands, to accompany him on a dangerous secret mission. They are to hide out on a Japanese-held island, watch for enemy ships and convey this information to their own pilots, to help them attack the Japanese convoys. Cable is intrigued when Bloody Mary, who thinks he is very attractive, tells him about the mysterious and forbidden island in the bay, BALI HA’I. Luther Billis’ immediatley makes it his mission to Lt. Cable to lead a pleasure-seeking expedition to the island. Meanwhile, Nellie’s friendship with Emile is known to the Island Commander and she is asked to obtain all the information she can about him. Confused about her feelings for Emile, Nellie decides to play it safe by simply deciding, “T’M GONNA WASH THAT MAN RIGHT OUT-A MY HAIR”. But Emile convinces her of his love for her (SOME ENCHANTED EVENING – REPRISE). Nellie is bowled over and believes that she and Emile could spend a wonderful lifetime together (A WONDERFUL GUY). Later in a tactical meeting, Emile refuses to join Cable’s mission. With nothing else to do, Cable visits BALI HA’I (REPRISE), where Bloody Mary introduces him to her beautiful daughter, Liat. They fall in love immediately (YOUNGER THAN SPRINGTIME). Later, at a dinner party, Emile introduces Nellie to two sweet native children, who she finds charming. But when Emile says they are his, the prejudices and fear inherent in her small town upbringing rise to the surface and, panicked, she runs from him and from their future. She throws herself into her work – as voluntary director and star of the home-grown “Thanksgiving Follies” show (HONEY BUN). Backstage, Bloody Mary and Liat have come to Cable, to convince him to take this chance for love (HAPPY TALK) but Joe, despite his deep love for Liat, is caught in a similar trap of his own prejudices and decides he cannot marry her. Emile, who has fought so hard all his life for freedom and fairness, cannot understand how two people such as Nellie and Cable can walk away from a chance for love, prevented by such an incomprehensible logic. This logic isn’t born in you, Cable explains bitterly; YOU’VE GOT TO BE CAREFULLY TAUGHT. Emile sees his dream of paradise fading away (THIS NEARLY WAS MINE). With nothing to lose, both Cable and Emile are feeling the recklessness of lost love, and with that recklessness comes the willingness to take greater risks. They embark on their spy mission to a neighbouring island where, for a few days, the plan works and they are able to transmit messages of Japanese naval manoeuvrings. Eventually they are discovered, however; Cable is killed, and radio contact with Emile is cut off. Faced with the sudden realisation that she may have lost Emile, Nellie is able to put her fears and meaningless prejudices into perspective and realises that her love for him and the things he stands for is paramount. She makes her way to his home and is giving lunch to his two children, whom she loves as her own when Emile returns. He is weary, he is battle-worn, but he is alive, reunited with his children, and with Nellie. FROM LEFT TO RIGHT: 1. 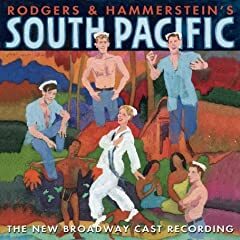 South Pacific Original Broadway Cast CD. 2. South Pacific Original Film Soundtrack CD. 3. South Pacific Complete Studio Recording CD. 4. South Pacific Television Film Soundtrack CD. 5. South Pacific Broadway Revival Cast CD. FROM LEFT TO RIGHT: 1. South Pacific Film DVD. 2. South Pacific Television Film DVD. 3. Tales of the South Pacific Book by James Michener. 4. South Pacific Vocal Score. 5. Rodgers and Hammerstein Book by Ethan Mordden. Various aspects if this show been discussed here. Feel free to respond to the discussions using the comment boxes below each article.